PPARγ, a member of the peroxisome proliferator-activated receptor family, is overexpressed in prostate cancer. Natural and synthetic ligands of PPARγ via genomic and nongenomic actions promote cell cycle arrest and apoptosis of several prostate cancer cells, in vitro. Insulin-like growth factor 1 (IGF-1) inhibits the adriamycin-induced apoptosis of PC-3 human prostate cancer cells. Therefore, we have analyzed the ability of two PPARγ ligands,15dPGJ2 and rosiglitazone, a natural and a synthetic PPARγ ligand, respectively, to increase the adriamycin-induced cytotoxicity of PC-3 cells and to suppress the IGF-1 survival effect on adriamycin-induced apoptosis of PC-3 cells. Our data revealed that both the PPARγ ligands increased the adriamycin-induced cytostasis of PC-3 cells, however, only rosiglitazone added to the adriamycin-induced apoptosis of PC-3 cells. In addition, rosiglitazone attenuated the type I IGF receptor (IGF-1R) survival signaling on adriamycin-induced apoptosis of PC-3 cells via its nongenomic action on ERK1/2 and AKT phosphorylation. Because the IGF-1R signaling is probably the most important host tissue (bone) metastasis microenvironment-related survival signaling for prostate cancer cells, we conclude that rosiglitazone effects on IGF-1R-mediated activation of ERK1/2 and AKT could have clinical implications for the management of androgen ablation-refractory and chemotherapy-resistant advanced prostate cancer with bone metastasis. Contributed by: Athanasious G Papavassiliou. Prostate cancer is the most common malignancy in men over 60 and it is associated with significant cancer-related mortality, especially after the systemic dissemination into bones (1,2). The blastic nature of bone metastasis in prostate cancer involves the role of several bone metastasis microenvironment-related growth substances, such as insulin-like growth factor 1 (IGF-1), interleukin 6 (IL-6), parathyroid hormone-related peptide (PTHrP), transforming growth factor β 1 (TGFβ1), and endothelin 1 (ET-1) (3, 4, 5, 6, 7, 8, 9, 10, 11, 12), which are involved, at least in part, in the development of the androgen ablation refractoriness and chemotherapy resistant phenotype of patients with advanced prostate cancer (13, 14, 15, 16, 17, 18, 19). Recently, the PPARγ expression in several malignant tumors has been well documented while the exogenous administration of PPARγ ligands has produced anticancer actions, in vitro (20). Indeed, several PPARγ ligands have inhibited cell growth and induced the apoptosis of prostate cancer cells acting via PPARγ-dependent (genomic) and PPARγ-independent (nongenomic) intracellular pathways (21, 22, 23). The term “nongenomic” refers to the actions of PPARγ ligands that are not mediated by PPARγ transcriptional activity. However, it remains unclear whether the nongenomic effects are actually PPARγ-dependent or -independent (24). Indeed, intracellular signaling pathways, which are activated by PPARγ ligands, could not be blocked completely by PPARγ antagonists, therefore, part of the anticancer effects of PPARγ ligands are largely considered to be nongenomic and to involve the phosphorylation of extracellular signalregulated kinases (ERK1/2) as well as a number of secondary signaling pathways including Fos/Jun, signal transducer and transcription activator, and nuclear factor κb (NFκB) (23, 24, 25). The genomic actions of PPARγ ligands, especially those of troglitazone, a synthetic PPARγ ligand, exert antiproliferative effects, which are, at least in part, mediated by the inhibition of androgen receptor (AR) pathway in androgen-sensitive prostate cancer cells (25). Indeed, PPARγ ligands have shown the ability to down regulate the production of prostate specific antigen (PSA) in LNCaP prostate cancer cells (23,25,26). Moreover, natural PPARγ ligands, such as 15dPGJ2, have inhibited the proliferation and have induced cell death of prostate cancer cells (27). In a clinical setting, troglitazone has produced objective clinical responses, the length of which suggested that it is rather an anticancer action than a transcriptional effect on PSA expression (reduction of PSA) in advanced stage prostate cancer patients (23,25). Herein we have analyzed the ability of PPARγ ligands, namely rosiglitazone and 15-deoxy-Δ 12, 14-prostaglandin J2 (15dPGJ2), a synthetic and a natural ligand of PPARγ, respectively, to act synergistically on adriamycin-induced cytotoxicity of PC-3 cells and to neutralize the type 1 IGF receptor (IGF-1R)-mediated intracellular survival signaling on the adriamycin-induced apoptosis of PC-3 prostate cancer cells. The latter has been characterized to be the most important survival factor pathway (ERK1/2 and AKT) for prostate cancer cells residing in bone metastasis microenvironment (28, 29, 30). The PC-3 cells, an androgen-insensitive, p53-negative, and Kirsten-Ras (K-Ras) mutated human prostate cancer cell line (31) were obtained from American Type Cell Culture (ATCC, Bethesda, MD, USA). PC-3 cells were maintained in Dulbecco’s modified Eagle’s medium/F-12 (Cambrex, Walkerville, MD, USA) supplemented with 10% heat-inactivated fetal bovine serum (FBS) (Biochrom, Berlin, Germany), 100 U/mL penicillin/streptomycin (Cambrex) at 37° C in a humidified atmosphere of 5% CO2. The PC-3 cells were treated with rosiglitazone (1 µM and 10 µM) (Cayman Chemicals, Ann Arbor, MI, USA), 15dPGJ2 (2 µM and 5 µM) (Cayman Chemicals) and the PPARγ antagonist GW9662 (Sigma-Aldrich, St. Louis, MO, USA) with or without 100 nM adriamycin and/or 25 ng/mL IGF-1 (Chemicon, Temecula, CA USA). PC-3 cells were plated at a cell density of 750 cells/well in 96-well plates and grown with DMEM/F-12 containing 10% FBS. PC-3 cells were exposed 24 h with the appropriate drug or combination of drugs at increasing concentrations. After 96 h of treatment, the PC-3 cells were cultivated with 10% MTT as described previously (16,18). MMT assays measure mainly the metabolic activity of cells in culture, indirectly associated with cell viability status. PC-3 cells were plated at a cell density of 3.5 × 104 cell/well in 6-well plates and grown with DMEM/F-12 containing 10% FBS. After 24 h of seeding PC-3 cells were exposed to the appropriate drug or drug combination in dose-dependent and time-dependent manner and the cell number was counted as described previously (4, 5, 6, 7,16,18). Trypan blue assays determined the actual cell number of living cells. This analysis of cell cycle allows the separation of PC-3 cell population in early apoptotic (AnnexinV-FITC stained), late apoptotic (both AnnexinV-FITC and PI stain), necrotic cells (PI stained), and non apoptotic/living cells (no stained cells). For such analysis, PC-3 cells were plated at a cell density of 4 × 104 cells/well in 24-well plates and grown in DMEM/F-12 containing 10% FBS. Twenty four h (24 h) after plating, the PC-3 cells were exposed to the appropriate drug and drug combination and the adherent and floating cells were analyzed as described previously (6,7,18). For cell cycle analysis, PC-3 cells were cultured for 96 h at 37° C in DMEM supplemented with 10% FBS in p100 culture plates at a cell density of 300,000 cells/well with and without the agent or the combination of drugs under investigation. Adherent and floating cells were combined, washed with PBS, and fixed overnight at 4° C in 70% ethanol. Fixed cells then were stained with an RNAse-containing propidium iodide solution. DNA content was analyzed on an FACS Calibur (Becton Dickinson, San Jose, CA, USA) flow cytometer, using the ModFit software (Verity Software House, Topsham, ME, USA). PC-3 cells were seeded in 6-well plates and grown in DMEM/F-12 containing 10% FBS. Twenty four h (24 h) prior to various treatments, the growth medium was changed to 0.5% FBS. For the experiments with the PPARγ antagonist GW9662, cells were incubated 1 h with 10 µ M GW9662 prior to various treatments. The cell extracts were obtained by lysis of the cells in RIPA buffer (50mM Tris-HCl; 150 mM NaCl, Sigma, St. Louis, MO, USA) containing 0.55 Nonidet P-40, protease 1mM phenylmethylsulfonyl fluoride (PMSF) (Sigma), 10 µg/mL aprotinin, and 10 µg/mL leupeptin; (Sigma) and phosphatase inhibitors (1mM sodium ortovanadate, 1mM NaF) (Sigma). After 30 min incubation on ice, the lysates were cleared by centrifugation (18,400 g, 15 min, and 4° C). Protein concentrations were determined by Bio-Rad protein assay (BIO-RAD Laboratories, Hercules, CA, USA). Equal amount of cell lysates (20 µg) were heated at 95° C for 5 min, electrophoresed on 12% SDS-PAGE under denaturing conditions, and transferred onto nitrocellulose membrane (BIO-RAD Laboratories). The blots were blocked with TBS-T (20 mmol/L Tris-HCl, pH 7.6, 137 mmol/L NaCl, and 0.1% Tween 20) containing 5% nonfat dried milk at room temperature for 1 h. The membranes were probed overnight with primary antibodies against phospho-ERK1/2, ERK1/2, phospho-Akt, and Akt (1:1,000 dilution) in TBS/T containing 5% BSA (Cell Signalling, Beverly, MA, USA). The blots were washed and followed by incubation with a secondary goat antibody raised against rabbit IgG conjugated to horseradish peroxidase (1:2,000 dilution) (sc2004, Santa Cruz Biotechnology, Santa Cruz, CA, USA). The bands were visualized by exposure of the blots to X-ray film after incubation with freshly made ECL substrate for 3 min (SuperSignal, Pierce Biotechnology, Rockford, IL, USA). The data of triplicate experiments were compared. Values are means ± SD. Statistical analysis was performed by Student t test. The level of statistical significances was set at P < 0.05. The natural PPARγ ligand (15dPGJ2; 0 µM up to 10 µM) and the synthetic PPARγ ligand (rosiglitazone; 0 µM up to 50 µM) produced a dose-dependent inhibition of the PC-3 cell metabolism as assessed by MMT proliferation assays. A 50% inhibition of the PC-3 cell metabolism/growth was achieved by the concentrations of 2 µM of 15dPGJ2 and of 10 µM of rosiglitazone (Figure 1A). The ability of 15dPGJ2 (2.5 µM and 10 µM) and of rosiglitazone (1 µM and 10 µM) to inhibit the growth of PC-3 cells was confirmed by Trypan blue exclusion assays measuring the number of live cells and using time-dependent and dosedependent experiments (Figure 1B). The effects of PPARγ ligands on PC-3 cell metabolism, growth, and apoptosis. (A) The dose-dependent effect of rosiglitazone (ROS) and 15dPGJ2 on PC-3 cell metabolism/growth as assessed by MTT assay. Note that the increasing concentrations of the ROS (0 µM to 50 µM) and of 15dPGJ2 (0 µM to 10 µM) resulted in a dose-dependent inhibition of the PC-3 cell metabolism/growth after 96 h incubation with the respective drug. A 50% inhibition of metabolism/growth of PC-3 cells was evident at concentrations of 2 µM of 15dPGJ2 and 10 µM of rosiglitazone. Results are expressed as percentage of controls in triplicate experiments. (B) Dose-dependent and time-dependent inhibition of PC-3 cell growth as assessed by Trypan blue exclusion assays. Note that ROS (1 µM and 10 µM) and 15dPGJ2 (2 µM and 5 µM) inhibited the number of living PC-3 cells in a time-dependent and dose-dependent manner (24 and 48 h). (C) An example of the PPARγ-induced apoptosis of PC-3 cells as assessed by flow cytometry (96 h incubation using AnnexinV-FITC and PI staining as described in Materials and Methods). ROS and 15dPGJ2 did not produce evidence of apoptosis of PC-3 cells under these experimental conditions. Percentage (%) of alive PC-3 cells distributed within the cell cycle: control = 89.5; ROS = 85.8; 15dPGJ2 = 88.4. (D) In this panel the results of apoptosis data of flow cytometry in triplicate experiments are expressed as number of apoptotic cells (%) compared with total cell number. Statistical analysis was performed by Student ttest. Values are means ± SD (P < 0.05). 15dPGJ2 and rosiglitazone produced an arrest of PC-3 cell cycle by increasing the % distribution of PC-3 cells into the G1/G0 phase (Table 1). However, they did not produce evidence of apoptosis of PC-3 cells, as assessed by flow cytometry analysis (Figure 1C,D). Distribution (%) of living PC-3 cells into the phases of the cell cycle; before and after exposure to PPARγ ligands (48 h) as assessed by flow cytometry. Combination treatment using standard adriamycin concentration (100 nM) with increasing concentrations of the PPARγ ligands 15dPGJ2 (0 µM up to 10 µM) or rosiglitazone (0 µM up to 50 µM) has further increased the inhibition of PC-3 cell growth as assessed by the increasing doses of either PPARγ ligand alone, under identical experimental conditions (Figure 2A). In addition, combination treatment, using increasing concentrations of adriamycin (0 nM up to 250 nM) plus a standard concentration of 15dPGJ2 (2 µM) and of rosiglitazone (10 µM) did document once again that both the PPARγ ligands acted synergistically with adriamycin to inhibit PC-3 cell proliferation, under identical experimental conditions (Figure 2B). Neither the 15dPGJ2 (2 µM) nor the rosiglitazone (10 µM) produced apoptosis of PC-3 cells, after treatment for 24 h, 48 h, 72 h, and 96 h (Figure 1C,D). Contrary to this, 100 nM of adriamycin did produce clear evidence of apoptosis of PC-3 cells, confirming our previously published data (Figure 3B) (11,13, 14, 15, 16,18,19,31). Combination treatment using adriamycin (100 nM) plus rosiglitazone (10 µM) further increased the rate of apoptosis of PC-3 cells, as compared with adriamycin monotherapy (Figure 3D). However, the combination treatment of 15dPGJ2 (2 µM) with adriamycin (100 nM) did not change the rate of adriamycin monotherapy-induced apoptosis of PC-3 cells under identical experimental conditions (Figure 3C). The data of flow cytometry experiments, expressed as the number of apoptotic cells (%) compared with total cells in triplicate experiments are shown in Figure 3 lower panel. The effects of rosiglitazone (ROS) and of 15dPGJ2 in combination with adriamycin (0 nM to 250 nM) on PC-3 cell metabolism/growth, as assessed by MTT assay. (A) The effects of 15dPGJ2 (0 µM to 10 µM) and of ROS (0 µM to 10 µM) alone and in combination with 100 nM of adriamycin. Note the additive effect of adriamycin with PPARγ ligands on the metabolism/proliferation of PC-3 cell. (B) The effects of the increasing dose of adriamycin in combination with a standard dose of PPARγ ligands. Note that PPARγ ligands (2 µM of 15dPGJ2 and 5 µM of ROS) further increased the adriamycin-induced inhibition of PC-3 metabolism/growth, practically, at any concentration of adriamycin used in our experiments (0 nM to 250 nM). Examples of the drug-induced apoptosis of PC-3 cells as assessed by flow cytometry, described in Materials and Methods. 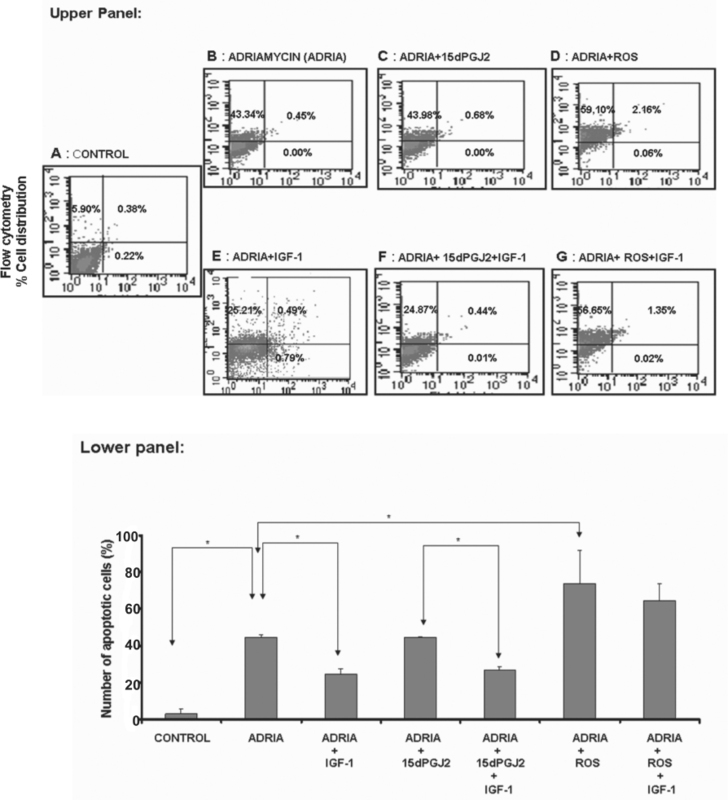 Upper panel: Adriamycin (ADRIA: 100 nM) produced clear evidence of apoptosis in PC-3 cell cultures after 96 h of incubation (B). Combination therapy of ADRIA (100 nM) plus 15dPGJ2 (2 µM) did not enhance the adriamycin-induced apoptosis of PC-3 cells (C). However, combination therapy of ADRIA (100 nM) plus rosiglitazone (ROS: 10 µM) increased the number of apoptotic cells of PC-3 cell cultures under identical experimental conditions (D). IGF-1 (25 ng/mL) neutralized partially the adriamycin-induced apoptosis of PC-3 cells (E). 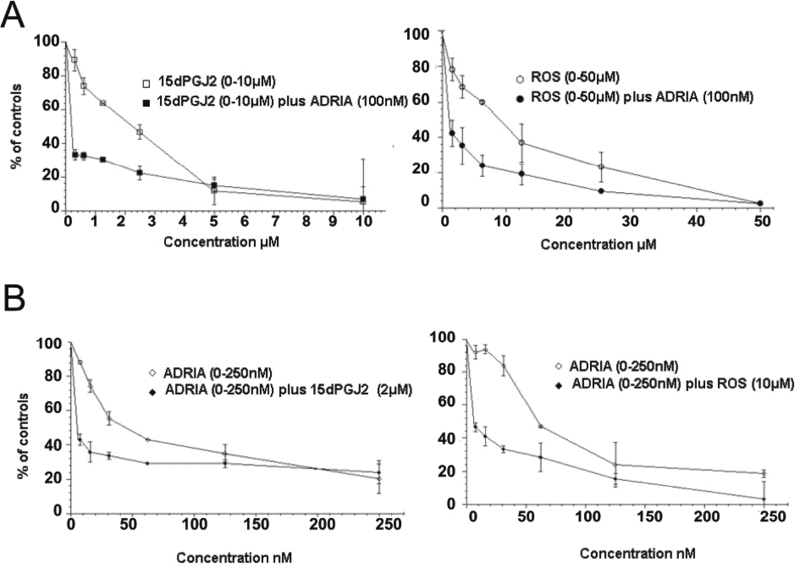 This IGF-1 survival factor effect was exerted also on PC-3 cell cultures exposed to the combination treatment of ADRIA (100 nM) plus 15dPGJ2 (2 µM) (F). Contrary to this, IGF-1 lost its ability to inhibit the adriamycin-induced apoptosis of PC-3 cells in cell cultures exposed to combination treatment of ADRIA plus ROS (G). Lower panel: in this panel the apoptosis data are expressed as number of apoptotic cells % compared with the total PC-3 cell number in triplicate experiments. Statistical analysis was performed by Student t test. Values are means ± SD (P< 0.05). Similar analysis revealed that IGF-1 (25 ng/mL) partially inhibited the adriamycin-induced apoptosis of PC-3 cells, confirming our previously published data (Figure 3E, see Figure 3 lower panel). This survival factor effect of IGF-1 also was evidenced in PC-3 cell cultures exposed to the combination treatment with adriamycin (100nM) plus 15dPGJ2 (2µM) (Figure 3F, see Figure 3 lower panel). However, IGF-1 survival factor effect (25 ng/mL) on the adriamycin-induced apoptosis of PC-3 cells was lost in the experiments which have used combination treatment of adriamycin (100 nM) plus rosiglitazone (10 µM). Apparently, IGF-1 has lost its survival factor activity on adriamycin-induced apoptosis in presence of rosiglitazone in the culture media of PC-3 cells (Figure 3G, see Figure 3 lower panel). Because the IGF-1R signaling pathway involves both ERK1/2 and AKT phosphorylation, we have analyzed the possible “cross talk” between the nongenomic intracellular signal transduction pathways of rosiglitazone and 15dPGJ2 with those of IGF-1R. Our experiments have involved incubations of PC-3 cells with IGF-1 (25 ng/mL and 100 ng/mL), 15dPGJ2 (2 µM), and rosiglitazone (10 µM) and the respective combination treatments in PC-3 cells for 0 min, 5 min, 15 min, 30 min, 60 min, and 6 h. Indeed, IGF-1 (25 ng/mL and 100 ng/mL) has activated ERK 1/2 and AKT phosphorylation after 5 min of exposure. 15dPGJ2 (2 µM) activated ERK1/2 after 15 min of exposure, however, without affecting AKT phosphorylation (Figure 4). In addition, 15dPGJ2 did not alter the IGF-1-mediated phosphorylation of ERK1/2 and AKT in experiments in which we have used combination treatments of 15dPGJ2 plus IGF-1 under identical experimental conditions (see Figure 4). Rosiglitazone (5 µM) neither activated the ERK1/2 nor the AKT phosphorylation of PC-3 cells. However, it attenuated the IGF-1-mediated phosphorylation of ERK1/2 and AKT in experiments which used combination treatments of rosiglitazone plus IGF-1 under identical experimental conditions (Figure 4). In addition, Gw9662, a PPARγ antagonist, did not alter the ability of rosiglitazone to block IGF-1 induced phosphorylation of AKT in PC-3 cells, suggesting a PPARγ-independent activity. 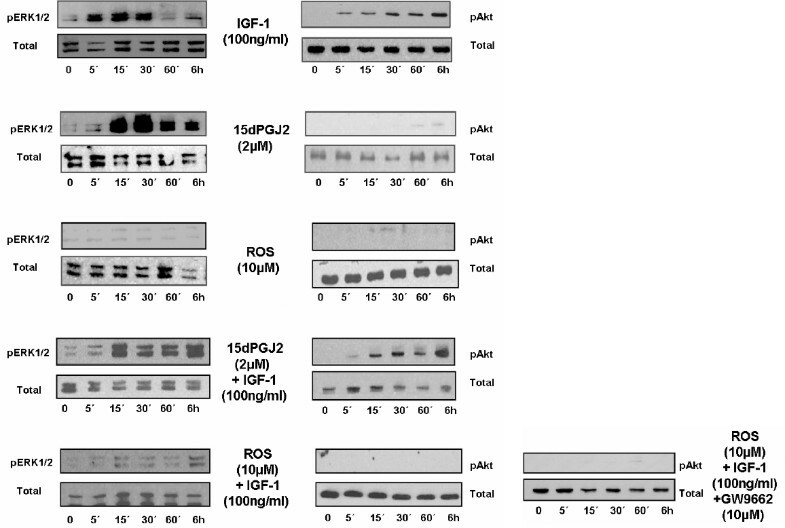 Examples of the Western blot analysis of the ERK 1/2 and AKT phosporylation after exposure to IGF-1 (100 ng/mL), 15dPGJ2 (2 µM) and rosiglitazone (10 µM) in PC-3 cells cultured with 0.5% FBS. The time of exposure was 5 min, 15 min, 30 min, 60 min, and 6 h (written on the figure as 5′ 15′ 30′ 60′ and 6h). Under identical experimental conditions, we also have examined the activation of ERK1/2 and AKT following combination treatments using IGF-1 plus 15dPGJ2 and IGF-1 plus rosiglitazone (ROS). Note that IGF-1 activated both the ERK 1/2 and AKT phosphorylation as published previously. In addition, 15dPGJ2 activated ERK1/2 phosphorylation while it did not activate AKT phosphorylation. Furthermore, 15dPGJ2 did not alter the IGF-1-mediated activation of ERK1/2 and AKT phosphorylation. In contrast, ROS did not alter ERK1/2 and AKT phosphorylation of PC-3 cells when given as a single agent, however, it blocked partially the IGF-1-mediated ERK1/2 phosphorylation and attenuated completely the IGF-1-mediated AKT phosphorylation of PC-3 cells when given in combination with IGF-1. The inhibition of AKT phosphorylation by rosiglitazone was not altered when the cells were pre-incubated by the PPARγ antagonist GW9662. PPARγ is expressed in both normal and malignant prostate cancer tissues as well as in prostate cancer cell lines (23,25). PPARγ mRNA expression in PC-3 cells is increased relatively as compared with other androgen-insensitive and androgen-sensitive prostate cancer cell lines, such as DU145 and LNCaP, respectively (23). The PPARγ gene harbors no mutations in PC-3 cells and the PPARγ ligands, both natural and synthetic, can inhibit the PC-3 cell growth, in vitro (23, 24, 25). The mechanism by which PPARγ ligands inhibit prostate cancer cell growth has been investigated previously. The inhibition of cell growth via genomic action affecting downstream events of androgen receptor (AR) signaling has been implicated in androgen-sensitive prostate cancer cell lines (23,25). However, the antiproliferative effects of PPARγ ligands cannot be explained totally by the inhibition of AR signaling, because they also can inhibit the proliferation of androgen-insensitive prostate cancer cell lines, as well as the proliferation of colon, breast, fat, and stomach cancer cell lines which are not under the androgen control. Therefore, PPARγ also are affecting other key cofactors of signaling pathways which are activated in cancer cells (20, 21, 22, 23, 24,26,27). In our experiments, PPARγ ligands have arrested the PC-3 cell growth without inducing the apoptosis of PC-3 cells. Our data have confirmed a recent study, which documented that rosiglitazone does not induce the apoptosis of PC-3 cells, however it sensitized the TRAIL-related apoptosis via the upregulation of Death Receptor 5 and downregulation of c-Flip expression (32). In addition, an independent study by Shiau et al. (33) also reported that another glitazone and 15dPGJ2 treatment led to reduced association of Bcl-2 and Bcl-xL with Bak, leading to caspase-dependent apoptosis in PC-3 cells. Thus the anti-apoptotic role of PPARγ agonists in prostate cancer cells appears conflicting. PPARγ ligands increased the distribution of PC-3 cells in the G1/G0 phase of the cell cycle. The latter is in line with the findings of other investigators, suggesting that PPARγ ligands promote PC-3 cell differentiation (G1/G0 arrest) by inhibiting β catenin and c-myc expression (34). Combination treatment of either rosiglitazone or 15dPGJ2 (standard concentration) with increasing doses of adriamycin and visa versa, have produced an inhibition that was greater than that produced by each drug alone, thus confirming previous studies which have suggested the use of thiazolidinediones in combination with other cytotoxic drugs in cancer therapeutics (35, 36, 37). Recently, a large number of studies suggest that the anticancer effects of PPARγ ligands on prostate cancer cells are PPARγ-independent and that the “nongenomic action” supersedes their well-established genomic action (20, 21, 22, 23, 24). In prostate cancer cell lines the activation of ERK1/2 and AKT have been demonstrated in treatment with endogenous PPARγ ligands. 13-(S)-HODE, the 15-lipoxygenase-1 (15-LOX-1) metabolite, upregulates the MAP kinase signaling pathway in human prostate cancer cells while 15-(S)-HETE, a 15-LOX-2 metabolite, downregulates MAP kinase. 13-(S)-HODE and15-(S)-HETE upregulate or downregulate, respectively, both the MAPK and AKT pathways after activation with IGF-1(38). The PI3K/AKT signaling pathway plays a major role not only in tumor development, but also in the tumor response to cancer treatment. There is evidence suggesting that activation of the PI3K/AKT pathway is related to chemotherapy-resistance of tumor cells (39,40). The PI3K/AKT pathway has become an attractive target for drug development. Inhibitors of proteins in several PI3K/AKT signaling pathways recently have entered clinical trials. These include inhibitors that target both upstream regulators of PI3K/AKT, such as growth factor receptors, and downstream effectors, such as the components of the mTOR pathway (17,40, 41, 42, 43). Thus we have examined whether PPARγ ligands can inhibit IGF-1R-related signaling pathways and subsequently the IGF-1-mediated survival factor effect on PC-3 cells. Combination treatments with PPARγ ligands plus IGF-1 were performed in PC-3 cancer cells and showed that only rosiglitazone inhibits the IGF-1 mediated activation of AKT. In addition, the PPARγ antagonist GW9662 did not affect the PPARγ ligand-induced neutralization of IGF-1R signaling in PC-3 cells. These findings suggest that the PPARγ ligand, rosiglitazone, interfered with the IGF-1/IGF-1R signaling independently of PPARγ ligands genomic actions (21,24,34,38, 39, 40). Contrary to rosiglitazone, 15dPGJ2 neither activated AKT when treated alone, nor modulated the effects of IGF-1 on ERK1/2 and PI3K/AKT signaling pathways. In prostate cancer, the development of androgen ablation refractoriness and chemotherapy resistance are crucial events which define poor prognosis in such patients (5,44, 45, 46, 47). The cause of androgen refractoriness and chemotherapy resistance is explained by different molecular processes which involve either genetic alterations present in specific cancer cell clones seeded into bones and/or non-genetic events, such as the role of bone metastasis microenviromentrelated growth factors which are activated locally (10,48, 49, 50). In a bone metastasis microenvironment, the most important local mediators for the development of chemotherapy resistance and androgen ablation refractoriness involve bone morphogenetic proteins (BMPs), heparin-binding fibroblast growth factor (bFGFs), IGFs, TGFβ1, IL-6, PTHrP, and ET-1, which are all able to act as survival factors, thus inhibiting chemotherapy-induced apoptosis (5,10,44, 45, 46, 47, 48, 49, 50). In a bone metastasis microenvironment of prostate cancer cell metastasis, locally activated stimuli can activate mitogen-activated protein kinases (MAPKs), especially ERK1/2 and AKT/NFκB/Bcl-2 (11, 12, 13,51). Previously, we have shown that exogenous administration of IGF-1 protects PC-3 cells from adriamycin-induced apoptosis. Indeed, a combination therapy using dexamethasone (suppressing the urokinase type plasminogen activator [uPA]-mediated increase of IGF-1 production in bone metastasis) and somatostatin analog (suppressing the systemic GH-dependent liver-derived IGF-1 production) has produced objective clinical responses to androgen ablation refractory prostate cancer patients (28, 29, 30, 31,42,43,52). Therefore, the concept of a novel hormonal manipulation focusing on the neutralization of the survival factor activity of local and systemic inhibitors of the apoptosis of prostate cancer cells has been proposed for patients with stage D3 prostate cancer. Herein, rosiglitazone appears to attenuate the most important survival factor pathway (PI3K/AKT) defined so far in prostate cancer cells, suggesting that this can be of clinical importance. In conclusion, our results suggested that the synthetic PPARγ ligand synergizes with adriamycin to increase adriamycin-induced cytotoxicity of PC-3 cells while it neutralizes the anti-apoptotic (survival) signaling of the IGF-1R in prostate cancer cells. 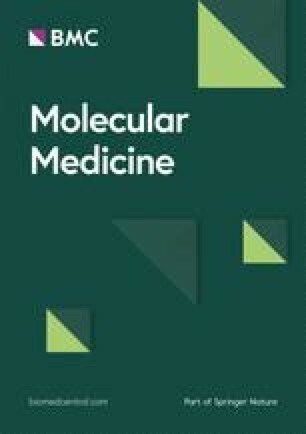 These data provide evidence that rosiglitazone-like PPARγ ligands can exert anticancer actions which can be either direct, via genomic and nongenomic actions on prostate cancer cells, or indirect, via neutralization of the survival factor effect of host tissue-mediated optimization of survival of metastatic cancer cells. The authors would like to thank Prof. Athanasios Papavassiliou for comments and suggestions regarding the context of this manuscript.